WHY AREN'T DOGS ALLOWED OFF LEASHES IN OTHER COUNTY PARKS? The County Off-Leash Dog Area is located at 314 State Highway 12, Flemington 08822 (Raritan Township) at the County Complex. This area is open from sunrise to sunset. No restroom facilities are available. FROM THE EAST (SOMERVILLE AREA): Take Route 80 to Route 287 South. Take the exit for Route 202/206 South. Stay on Route 202 South, over the Somerville Circle, to Flemington. At the Flemington Circle, take the second right- hand exit onto Route 12 West. Stay on Route 12 through two more circles. The Route 12 Complex is on the left, approximately 2 miles from the last circle. The Dog Area is on the left as you enter the complex. FROM THE NORTH (CLINTON—ROUTE 78/22 AREA): Follow Route 31 South toward Flemington. At the Flemington Circle, take the first exit onto Route 12 West. Follow directions above. FROM THE SOUTH (TRENTON AREA): Follow Route 31 North to the Flemington Circle. Go 3/4 of the way around the circle and get onto Route 12 West. Follow directions above. 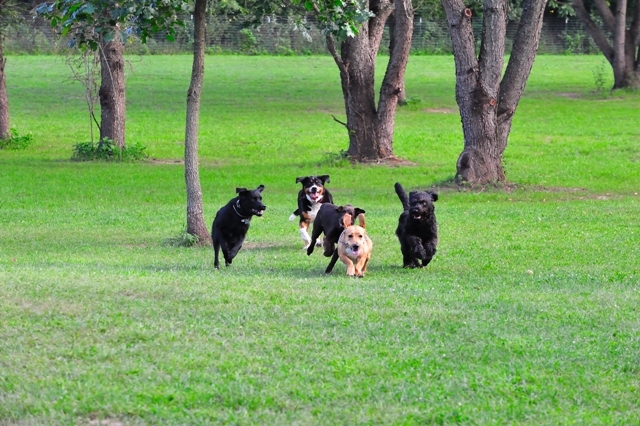 The Hunterdon County Off-Leash Dog Area is open to the public from dawn to dusk, daily. Users must abide by all Rules and Regulations governing the use of Hunterdon County Parklands and must comply with the directions of County Personnel. years of age and older are permitted within the fenced enclosure without adult supervision. Use is limited to two dogs at one time, per person. Please limit use to 30 minutes. Dogs must wear flat-buckle collars, displaying a valid license and current vaccinations tag. Users must properly secure access gates and leash their dogs prior to entering and upon leaving the off-leash dog area. Users must carry a leash for each dog within the fenced enclosure, at all times. Users must clean up after their dogs. Rawhide and other dog food products are prohibited within the fenced enclosure. Food and beverages (for human consumption) are prohibited within the fenced enclosure. Users are responsible for any damage caused by dogs, including, but not limited to: digging, scratching, chewing, and illness, including damage to the off-leash dog facility, access pathways, and parking areas, vehicles, property, and pedestrians. The potential for injury to other visitors and other pets. Most dogs are friendly, even to unfamiliar people and pets. However, some are not, and in addition a large dog might jump up on someone in a friendly fashion and knock them down. Pet owners can be held liable for injuries or damage caused by their animals. the potential for frightening other visitors, especially children. Even if a dog is friendly, people sometimes may be frightened to see a dog running up to them. It is unacceptable for park visitors to be made uncomfortable or frightened by unrestrained pets. The potential for disturbance to wildlife, especially sensitive species like ground nesting birds. Virtually all dogs will pursue wildlife, either playfully or with serious intent to do harm. Some of our parks are home to endangered or threatened species, which are especially vulnerable. Even if a dog does not actually catch the animal it pursues, it may cause the animal to lose precious energy or time it needs to care for its young. Even if a dog does not actively pursue wildlife at all, its mere presence may be enough to scare off wildlife. Park visitors who are looking for wildlife may be less able to enjoy themselves as a result. For the above reasons, the six-foot leash requirement WILL BE STRICTLY ENFORCED. Contact us at the Park Office to report a violation or to share comments or concerns. Thank you for your understanding in preserving the quality of everyone’s visits to our county parks! Both parks have a fenced-in, off-lease dog area. These areas are not part of the County Parks; please contact the respective townships for information.